Wedding planning- we are all experts by the end of it and this is usually because we put a foot or two wrong, but we need to plan like experts from day one. It's very hard considering there are just so many things to think about, decisions to make and elements to bring together seamlessly. I hope these blog posts may help you think a little more like an expert. When it comes to booking vendors, some couples simply get it done, one by one. This can be great but not if the wedding as a whole hasn't been planned out. There's a couple of things that come before others. Let's talk about the venue, there are so many options these days, beautiful vineyard, elegant garden, magical seaside and edgy industrial to name a few. Each venue lends itself to a certain style of wedding but they also have very different facilities and capacities. 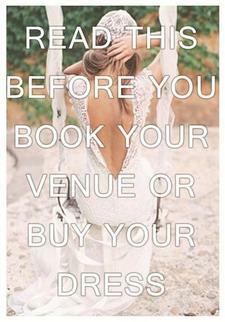 I come across clients that have rushed into booking their venue before writing out a rough guest list. This means that sometimes the guest list is cut down to fit the venues capacity. Every couple has at one point said that their guest list was larger than they had expected. The wedding dress, most brides cant wait to start shopping for one and every now and then they find the one and are filled with utter happiness, that is until they realise it just doesn't fit their wedding theme or venue. It's really important to book your venue and knuckle down on your theme before picking out that gown.